I really like this picture of Desert Delve, posted as part of a review in July 2014, over on the Roll Play blog (or you can go directly to a – reasonably – translated version of the blog if you don’t speak French and want to read the review – Roll Play Google Translated). Actually, I like all of the pictures on the blog entry – but this one really caught my eye because of the focus on the finer detail. 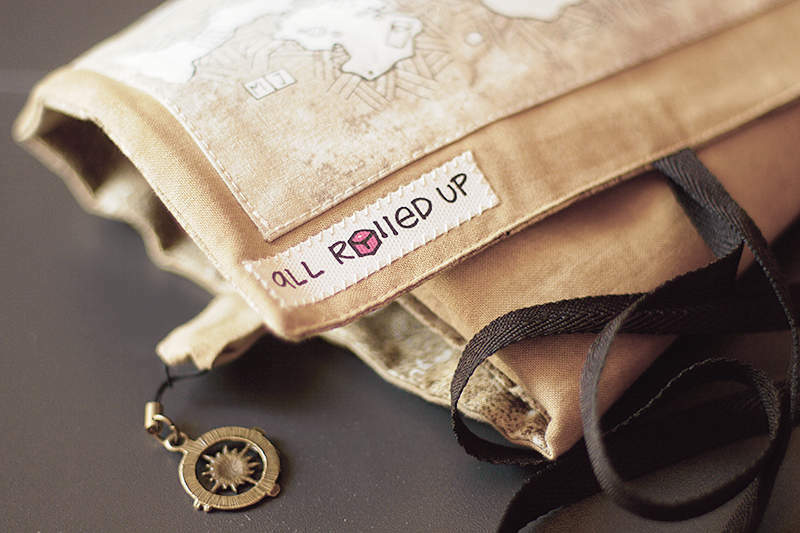 The careful stitching on the badge – which we take a lot of care over and has evolved over the last 18 months of making All Rolled Up dice bags; the different textures of the fabrics inside and out; the coordinated colours; and, that neat little charm. The interesting thing for us when we attend events is that seeing, touching and opening up an All Rolled Up makes all the difference in appreciating the work that goes into making them. No, this is not a simple dice bag, but a carefully considered piece of handmade gaming-ware, given consideration and considerable forethought. The contrast and coordination of fabrics and colours are something we take great pains over, right from the moment we select and source new fabric. I think these pictures go some way to bridging the gap between hearing about the All Rolled Up game roll and having one in your hand. However, if you get the chance to come along to an event we’re attending, I heartily recommend it – we’re happy to help and offer a very wide range of options and designs. If I may, the photograph is this wonderfully gifted young professional photograph : http://elisebrioul.wix.com/photo-graphic.